Today is the day for talking about how to add value to your home and if you’re selling or about to put your home on the property market, it’s always worth investing a little time and money in making some of these changes. 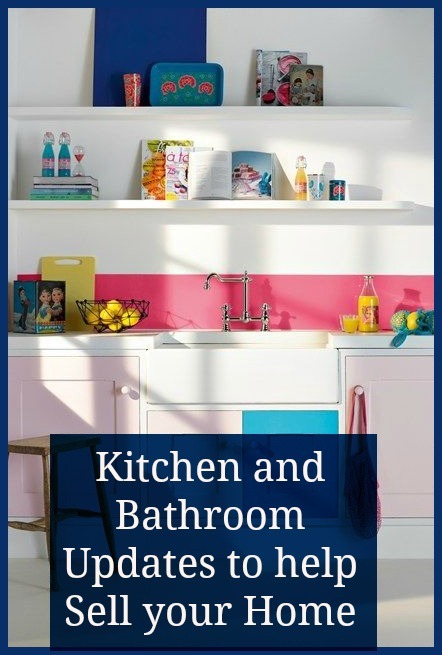 This guest article looks at how to improve the kitchen and bathroom. The key to making a quicker house sale is to find out what buyers are looking for. One of the key selling points of your home is your kitchen, and the other is your bathroom. In fact, sprucing up these rooms can add a significant amount of value onto your home. So what can you do to the kitchen and bathroom to encourage buyers to make an offer? Many experienced house sellers actually factor a full kitchen (and bathroom) refurbishment into their budget. If you are looking to attract buyers as well as make a tidy profit then this is something you can consider. If you spend £20,000 on a new kitchen, you could add double this to the value of your home. However, this will require you to set aside some of your own money when selling but you will make a return on your investment. If you do not have the cash or the time to do this, there are other options. Replace the flooring in your kitchen with some ceramic tiling and replace the worktops and cupboards if you can stretch to this. If not, you have to improvise. Replace the handles and doors on cupboards, make sure that your appliances match (even if they don’t come with the house) and try to replace your flooring with cleaner, newer vinyl flooring. Also, ensure that you have all appliances neatly tucked away to create more space. Again, full refurbishment is ideal if you have the budget. Replace the bathtub and have a new shower fitted. Also replace the sink and WC as well as the fixtures and fittings. However, you may be able to get away with replacing some of the fittings to give the illusion of a new bathroom. The bathtub is expensive to replace so you may be able to get away with replacing only the sink and WC. You can replace the taps and replace the rails or any other fixtures. Also, adding a large mirror to a wall can create the illusion of a bigger bathroom. Add some potted plants or a picture to one of the walls to give a homely feel. You could even add a heated towel rail for convenience and to attract buyers’ attention. Replace tiling or clean up and repair the tiles you already have. New flooring always attracts buyers so go for tiling to ensure that they do not need to replace it themselves. If you have vanity cupboards replace these or repaint them to make them look good as new. Additionally, paint the ceilings and repaint the walls in a neutral, light and airy colour in the kitchen and bathroom. New buyers want to be able to entertain in their kitchen and they want to be able to relax in their bathroom. If you create a modern, yet comfortable environment, buyers will instantly warm to your home. These renovation will undoubtedly contribute to improving the look and feel of your house. Furthermore, it will also help you sell your house quickly. Previous Post Could A More Stylish Garden Raise The Value Of Your House? 100% right, the two most important rooms to get right when selling are the kitchen and bathroom (in that order). Partly because these are the rooms most important to women (in general, not being sexist!) and partly because these are the rooms people find most difficult to do up, so if work in these is required it’s a turn off for many.